I've never written a sock review but I simply love these Ultimax. I crushed my right ankle breaking horses when I was in the seventh grade and evidently made the medical textbooks on how the doctors rebuilt it. I still have metal pins holding it together. They told me I would be plagued with arthritis throughout my life. Well, I got along very well until I turned 55 or so. Then the swelling and stiffness started in. I have to be very careful about my selection of boots, for instance. Too heavy and they will cause my ankle to swell and stiffen. Without the right arch support my ankle will swell and stiffen. I have tried wrapping my ankle with an Ace wrap, but I usually end up having to take it off. The elastic support in these socks seems to be just enough to give me support without cutting off the circulation. However, I still have to match a good pair of boots with my socks. I normally go out with Hikers rather than hunting boots now because of the weight of most hunting boots. And my cowboy boot days are over. Still, these socks are the only thing I've found that help me with my unique problem. After my first African safari (where I was walking several miles per day with no problems) we went to Washington D.C. for an education convention. My wife wanted to see the sights and I did not bring a good pair of hiking boots or the socks. I was so crippled-up after three hours that we stopped at a shoe store and bought some Merrick hiking boots so I could go on. It is simply amazing what a difference a good pair of boots or support socks can make, especially when you get to be my age. 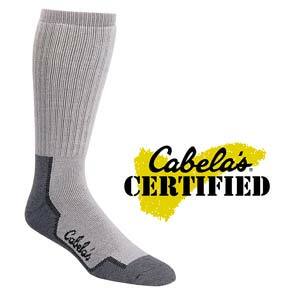 Since I am such a dedicated outdoorsman and hiking/hunting are my only real outlets, such a simple thing as sock selection can be very important. It is literally a quality of life issue for me. I don't know what I would do if I couldn't get out on the weekends! Copyright 2005, 2016 by Randy D. Smith and/or chuckhawks.com. All rights reserved.